For years, pundits have been calling for the demise of Microsoft.And for years, Microsoft has just kept on trucking along. And perhaps, that’s what’s going to happen, yet again. Perhaps, Microsoft will be fine. But, this time it’s really starting to look different. The world’s number one traditional PC maker, HP, just announced plans to sell a $170 7-inch Android tablet in April. That’s less than the cost of the Amazon Kindle Fire HD and Google’s Nexus 7, both based on Android, and both of which sell for $199. It’s less than Apple’s $329 iPad Mini. Most importantly for this story, it’s significantly less than the $650 HP charges for its Windows-based ElitePad, which is geared more towards enterprise customers. HP is trying to stay somewhat diplomatic. 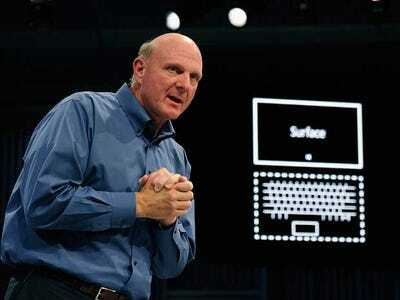 It says in an interview with The Verge that it will have a broad range of tablets running both Android and Windows. The prices will range from $170 to $700, depending on the operating system and the tablet’s capabilities. So, perhaps it’s too early to write that HP has totally dropped Microsoft to pursue a low-cost, mass-market strategy with Android. We’ll see what HP introduces later this year. But it is telling that the first HP Windows 8 tablet is relatively expensive and aimed a niche market, while its first Android tablet is low cost aimed at the mass market. As for the hardware, you’d never guess from holding it that this is a $169 tablet. Its got a soft touch back plate and a stainless steel side, and, more importantly, it feels sturdy without being heavy, and is comfortable to hold in portrait or landscape because of its 16:10 size. It’s essentially like using a variant of the Nexus 7 that is made differently, but not perceptibly worse. And cheaper. We’re not sure how, or if HP can make money on this thing. After all, most people believe Amazon is losing money on the Kindle Fire, hoping to earn it back through sales of digital content. There is not alternative revenue stream for HP. Perhaps HP with years of manufacturing experience can get its costs down. Or, maybe it’s just a piece of junk that feels nice initially. Whatever the case may be, there’s probably an obvious reason it runs on Android and not Windows 8. Android is free while Windows 8, which comes bundles with Office, is much more. We’re not sure HP could afford to sell a Windows-based tablet for $170. And that’s the conundrum for Microsoft. How can it continue to make big profits in a world where a better mobile operating system is being given away by Google? The tablet market is the future of computing. PC sales are declining while tablet sales are growing. When HP, the biggest PC maker in the world, decides the best angle to approach the consumer tablet market is to use Android, it’s not good for Microsoft.